For those used to seeing their jelly babies about a half an inch tall the latest installation at the Marble Arch in London comes as a bit of a shock. Larger than life jelly babies now grace the prestigious site in a highly acclaimed resin sculpture titled, Jelly Baby Family and created by artist, Mauro Perucchetti. 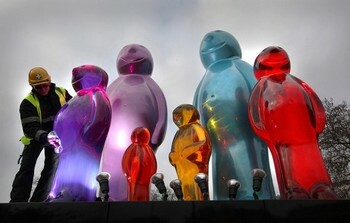 The extraordinary statue of seven colored jelly babies was unveiled on December 13. The pop artist describes his work as the embodiment of family unity. He also says the sculpture depicts the multicultural aspects of contemporary society, especially in metropolitan centers like London. The sculpture has been erected as part of the Westminster Council, City of Sculpture Festival. The festival attracts pieces from the most illustrious artists and galleries in the world. Jelly Baby Family weighs 3.2 tons and stands over fifteen feet tall. Perucchetti’s sculpture is just one of many creative works that will be on display on Park Lane during the festival. Besides Jelly Baby Family, exhibition viewers can expect to see a fifteen foot child’s hand pushing a black Fiat Cinquecneto. The car featured in the sculpture titled, Vroom Vroom was artist, Lorenzo Quinn’s, actual first car. The sculpture was created to reflect the child within all of us. The hand is a focal point of many of the artists works because he says, the hand is a symbol of human power, the power to love, hate, to create or to destroy. Quinn is highly acclaimed and has in the past produced pieces for the Vatican City and the United Nations. Jelly Belly Family and Vroom Vroom are just two of sixty world class pieces that are on show. The sculpture styles displayed reflect the many genres of sculpting including traditional and contemporary styles. The city hopes that the exhibit will enhance Westminster’s reputation as a cultural hub. This Westminster area of London is known for famous art exhibits, galleries and museums. The project is also a push to support art projects in the city ahead of the Olympic Games. Funding and support for the exhibit is provided by the city council and local galleries including the Halcyon.